Segolene Royal, the photogenic Socialist who could become France's new president next year, has said she is not going to sue two magazines that published photographs of her and her family taken secretly on a beach. According to a spokesman, Ms Royal "does not want to give the photographs more importance than they deserve", though she does regard them as a breach of her personal privacy that could be actionable in law. The pictures were taken by paparazzi who followed Ms Royal and her partner, Socialist Party (PS) First Secretary Francois Hollande, to their holiday spot near La Rochelle. They show her in a turquoise bikini, walking along a beach, swimming and sunbathing on a rubber dinghy. Hollande and the couple's elder daughter - they have four children - are also shown. Though on one level they are perfectly inoffensive, the photographs have raised hackles in France because they seem to confirm what many see as the growing trivialisation of national politics. Up until a couple of years ago, French leaders were protected from press intrusion by the country's very strict privacy laws. A violation of privacy - atteinte à la vie privée - is a criminal offence punishable by a large fine. Some celebrities - such as members of the Monaco royal family - make a tidy sum every year from suing the press. But recently two processes have gone hand-in-hand. On the one side, the market for "people" magazines in France has sky-rocketed. There are now more than half a dozen major weeklies - with names like VSD, Closer, Voici, Gala, Public - each printing up to half a million copies. At the same time, with the April 2007 election looming, the two front-runners - Ms Royal and the right-winger Nicolas Sarkozy - have both made the same calculation that wooing the popular media is an unavoidable part of modern-day campaigning. Both have arranged for themselves lavish spreads in Paris Match and other glossies. Mr Sarkozy's long-running marital problems with his wife Cecilia have become a soap opera, and their recent reconciliation was the occasion for a succession of happy-couple shoots. And Segolene Royal, 53, who underwent a major image change before launching her presidential bid - what the French call un relooking - has also shown every inclination to court coverage. That explains why her apparent anger at the latest paparazzi-pops rings pretty hollow. As Marc Dolisi, editor of VSD said, "Segolene Royal and Nicolas Sarkozy have both been happy to put their private lives on display when it suited them. It was they who took the first step." The development has given rise to a ghastly neologism which is weaselling its way into the French tongue: "la pipolisation". Le pipol is a misspelling of le people, a word which in French refers not to the man or woman in the street but to the people in the magazines: the stars, the footballers, the royals, the celebs. According to critics of the way things are going, French politics is pipol-ising: in other words, it is becoming obsessed with the image of individuals, rather than the substance of policy. It is hard not to see some truth in this, though the process is probably inevitable. 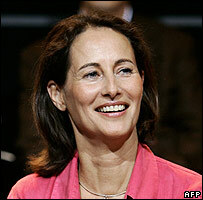 Laurence Piau, editor of Closer magazine, put it succinctly if ungrammatically: "Today Segolene Royal is un people."